The substantial remains of a strong and important motte and bailey castle dating from the 11th to 13th centuries, with surrounding walls, ditches and earthworks. A palace complex was added in the 13th century. The situation of this place is said by Stukeley to correspond with the Roman station of Durocobrivae ; then it became a seat of the kings of Mercia, and it is by tradition the scene of the great council held by King Wihthroede in A.D. 697, where many new Saxon laws were passed. In 1066, after the Battle of Senlac, or Hastings, Duke William, having crossed the Thames at Wallingford, proceeded to Berkhamstead, and halted there to receive an English deputation headed by the Aetheling Edgar, the rightful heir to the Crown, with the Earls Edwin and Morcar, and Aldred, Archbishop of York, and others. Thence, after the exchange of fair promises on both sides, William advanced to Westminster, where Aldred performed the coronation ceremony. In the disaffection which sprang up shortly after, Frederick, Abbot of St. Albans, opposed the claims of the new King, who at once resolved to go to St. Albans; but the bold abbot hindered his march by felling trees across the road, and at the conference which ensued induced the King to swear on the abbey relics that he would keep to the old laws of the country. This oath being, of course, at once broken, the partition of England amongst the Norman followers of the Conqueror was commenced, when Berkhamstead was granted by him to his half-brother Robert, Earl of Mortaigne, or Moreton, who obtained 793 manors in various counties, and was created Earl of Cornwall. Camden says it was he who built this castle; that is, he probably erected a Norman stone keep on the Saxon burh. His son and successor, William, claimed from Henry I. his uncle Bishop Odo’s earldom of Kent, and getting an adverse decision, took up arms against the King in Normandy, .when he was at once deprived of his earldom and possessions by Henry, his cousin, who, on getting him into his power two years later, caused his eyes to be put out, and banished him from the realm. The Castle of Berkhamstead was razed to the ground, and the forfeited title conferred on Stephen, Count of Blois, afterwards King of England. The manor was given by Henry to his Chancellor, Randulph, who is said to have rebuilt the castle, and to have then invited the King to visit it ; on which occasion, according to Henry of Huntingdon, an extraordinary occurrence took place: Randulph, while conducting Henry to the castle, and pointing out to him with much elation the fabric he had reared, fell off his horse, and was ridden over by a monk, whereby he received such injuries that he died a few days after. Henry II. granted the custody of this castle to a priest then rising to great eminence at his Court, namely Thomas a Becket, after whose death Berkhamstead was used by this King as his favourite abode, and the Court was held here frequently. King John made this the jointure-palace of his Queen Isabella, but in 1206 bestowed the place on one of his most powerful barons, Geoffry FitzPiers, Earl of Essex, to whom succeeded his son John, Chief Justice of Ireland, and either this man or his father may have built the existing walls there. During the civil war which followed the signing of Magna Charta John caused this castle to be strengthened, and with effect, for, when the Dauphin, Louis (who had married John’s niece, the Princess Blanche), came against Berkhamstead, after the capture of Hertford, he made no impression on it, and only obtained possession when the garrison were ordered, after the death of King John, to surrender it. When the French had to leave the country the place again became royal property. Richard, the younger son of King John, was created Earl of Cornwall 11 Henry III, and succeeded to these lands and castle of his mother Isabella. His second wife, Isabel, widow of the puissant Gilbert de Clare, Earl of Gloucester, died here in childbed, as did likewise his third wife in 1261, four years after he had been crowned at Aix-la-Chapelle by the empty title of King of the Holy Roman Empire, as Germany was then called. He died here in 1272, and on the death of his son Edmund, the second earl, s.p., the Castle and Honour and town reverted to King Edward I., his cousin, who gave it all in dower to his second queen, Margaret, daughter of Philip, King of France. Edward II. bestowed the place on his worthless favourite, Piers Gaveston, who was here married to the King’s niece, with great festivities at which Edward assisted ; and after his fall William Montacute and John de la Haye enjoyed possession. The reign of Edward III. brought good times to Berkhamstead, since this King chose it as his chief place of residence, while Windsor was yet a-building, and large sums were expended in placing it in proper order for the King and his Court. The early years of Edward the Black Prince were passed here, and he received from his father the Castle and Honour and the park of Berkhamstead when created Duke of Cornwall, ever since which far-off time the place has been included in that Duchy. Berkhamstead indeed gave the title of Marquess to the late King of Hanover. Hither they brought the captive King John of France on his removal from Somerton (LINCOLN, q.v.). After his retirement from the French wars, the Black Prince came to live here, and here he was seized with an illness, accompanied with fits, which caused his death in 1376. 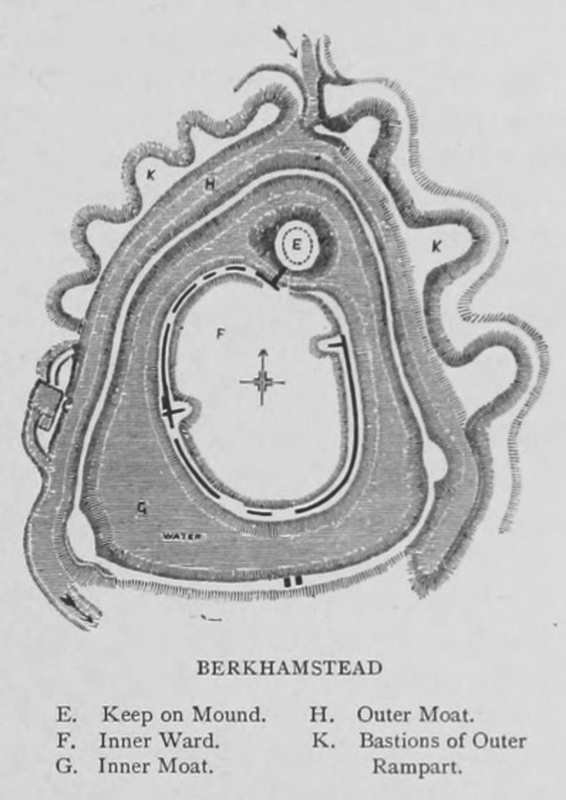 The castle then passed to his son, afterwards Richard II., during whose lifetime Robert de Vere, Duke of Ireland, was allowed to occupy Berkhamstead. At his elevation to the throne, Henry IV., lived here with his family, in the early years of his reign, and it was here that he kept in durance the two Mortimer boys, whom he so closely guarded ; one of them, Edmund, Earl of March, haying been acknowledged by Richard II. as heir to the Crown. At Berkhamstede is an old large castelle in a roote of an hille stonding sum what low, and environid with a mote, to the which, as I coulde perceyve, part of the water of the ryver there hard by doth resorte. I markid dyverse towers in the midle warde of the castelle, and the dungeon hille. But to my sighte it is much in ruine. The house of Bonehomes, caullid Asscheruge, of the fundation of Edmunde (2nd) Erle of Cornewale, and owner of Berckhamstede Castel, is about a mile of, and there the King lodgid. The King here mentioned is Henry VIII. ; and the castle, we may assume, was not in a fit state to receive him. So the wreck went on till Queen Elizabeth granted the place, at the nominal rent of a red rose annually, to Sir Edward Cary, who out of the ruins to which it had been reduced, built his once huge mansion of Berkhamstead Place on the summit of the overstanding hill. Berkhamstead is now held by Earl Brownlow, under the Duchy. At the N.E. end of Castle Street are to be seen the remains of the old structure, standing on a chalk foundation in a marshy level on the left bank of the Bulborne stream, and now in close proximity to the Grand Junction Canal and the London and N.W. Railway, which latter, with the main road, passes between the castle and the town. There is now little to see but the earthworks : these consist first of the ancient English burn, the circular mound 60 feet high, and 40 in diameter at top, with steep sides and encircled by a wet ditch ; then on the summit are the foundations of the circular keep, about 8 feet thick, and connected with the other buildings by a piece of wall remaining on the slope. The inner ward is oval in form, measuring 500 feet N. and S., and 300 E. and W., surrounded by a wall of which three-fourths exists, 20 feet in height, which has been crenellated, and on the W. side of which is the fragment of a mural tower ; there are also two pieces of cross walls, relating to the castle buildings. The opening of the entrance gateway at the S. end can be traced, but the towers of this have quite disappeared ; all that remains of masonry is of chalk-flint rubble which may be Norman work, all the ashlar and dressed stone having been removed by the Carys. The whole is surrounded by a deep and broad moat, double on the N.W., and triple elsewhere, and outside the first moat, running around three sides northwards, is a curious line of double embankments defended by its own ditches and by a range of earthen bastions, flanking the exterior on all sides except at the gorge on the S., which was probably defended by a strong palisading (Clark). The ancient entrance was on the town side, probably over a causeway through the easily flooded low grounds, and the remains of the grand entrance leading into the inner ward are still traceable. Within this enceinte were the lodgings, the hall and offices, and the chapels, of which no less than three are mentioned, but nothing of all this remains. Then on the N.E. quarter was the Derne-gate leading over three several drawbridges into the park. The entire works cover an area of about eleven acres.